Pinyon publisher Gary Entsminger and artist Susan Elliott spend most of their time publishing other writers' books in their cabin post called Pinyon Publishing nestled in the Colorado Rockies, but now and then they take time off to produce their own writings and artwork. Together, they have written Remembering the Parables, Making the Most of WriteItNow4, and Ophelia’s Ghost, the latter, an intriguing work of fiction. 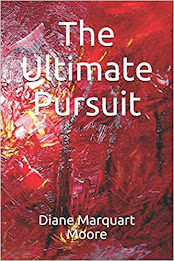 This novel set in the 50's in the southwestern U.S., featured Eva, an anthropologist who disappeared from a campsite in the Canyons of the Ancients, and readers were treated to encounters with parallel universes, Pueblo cultures, UFO's, Shakespeare and the phenomenon of ghosts. Fall of '33 takes us back to an earlier time when Eva is only 12 years old, a passenger on a train headed for Django, Colorado. 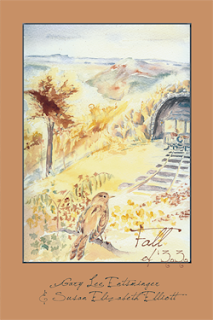 She is deeply immersed in memories of the twenty days preceding her train ride, recalling her life in Virginia's Blue Ridge Mountains and recording them as the train travels west. Her feelings are reflected in nostalgic descriptions about her childhood; e.g., "A boy standing beside a Model A Ford near the tracks waves as we pass. He looks about the same age as Billy, and our farm flashes in my mind, as we drove away in Poppy's Model A…I see Billy the day after I knew we were leaving. We were walking home from the bus stop. A hermit thrush whistled from the woods, its hollow notes ethereal and flute-like. The long shadows disappeared into deeper darkness. Indian summer, but the speckled red and yellow leaves swirling past our feet reminded us that winter was coming…"
The train takes Eva through vivid experiences to the Century of Progress World's Fair in Chicago, across the Midwest, and into Colorado, but it is the journey in Eva's imagination–the memory of her childhood home and stories told by her Grandfather Poppy–that will capture readers. Eva moves in and out, from visible worlds seen from the window of the train to invisible worlds, which her grandfather explains are important for ancestral connections. "Memory is more than a scrapbook of images," he tells Eva, encouraging her to connect with spirits "on the other side of the veil" to bring about a change in consciousness. Readers are led to believe that she will also receive consolation about moving from her childhood home from ancestral spirits constant in memory. Stories about Eva's Native American ancestry and the mysticism inherent in these tales are interwoven throughout the novel. They reminded me of an interview with Bill Moyer and the poet Sherman Alexie, in which Alexie emphasizes how important "story" was and is for survival–in Eva's case, the story of her Turtle Island ancestors who survived a great flood and intermingled with newcomers called "the golden ones." Each chapter title of Fall of '33, or each day that Eva writes about, is symbolized by a creature or force in the natural world; e.g., turtle, dragon, deer, the river, eagle, red bird, flower…the writing is an assignment given her by Poppy in which she uses the "Day Memory System." Using an image for each day, Eva faithfully records her observations about the landscape and happenings in both the journey and her past life involving friends and family on the farm and in rural social gatherings. One of the most arresting chapters features the family's venture into Chaco Canyon, New Mexico. On this site, they view a circular ruin, fifty feet across and sunken fifteen feet into the ground which was used as the center of religion for various groups of Native Americans. "The sipapu is this entrance, or passageway, for the souls to emerge from. And the souls, the people, go out on the path, to the center. And when they die, they come back. Out and in and back out again. Like the seasons…a middle place, a meeting ground, where all souls come together..."
Past, present, and future are represented in this complex novel filled with descriptions of the South and West and the impressive narrations by two naturalists who aren't timid about taking readers on a real life journey through dark times and a mystical journey into the life of the spirit enhanced by "story," the stuff of survival.